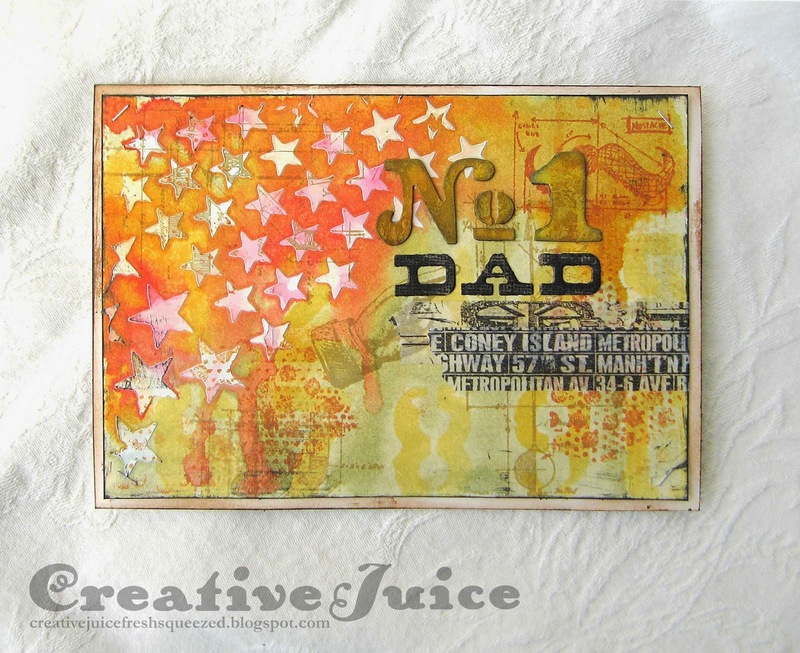 Creative Juice: Happy Father's Day! It is so much fun seeing what everyone does with the CC3 challenges. I read your blog through netvibes. Don't know if you see those statistics. And I added you to my favorite blogs on pinterest. thanks as always for sharing. Lisa, this is wonderful. Great layering and color! love it! No doubt, your dad loved your lovely card. The stenciled stars are the perfect backdrop for your No. 1 "prizewinning" dad sentiment. Thanks for sharing this brilliant card! Lisa you created such a fabolous card. Gosh love the colors you chose and the way they faded into each other. Love your building up the background and your text. Thanks a lot for sharing your art ! This card has so many awesome details-I am not sure what to look at first!!! Oh WOW!!!! That is fantastic....no doubt he was thrilled with it! !